Looking for an easy one pot dinner or meal prep? Try this delicious one pot chicken and quinoa with balsamic dressing! click here to pin this one pot chicken recipe for later! Today I’m back with another easy one pot recipe because you know how lazy I am and how I hate doing dishes. I also love one pot chicken recipes because chicken is my go-to for easy healthy recipes. 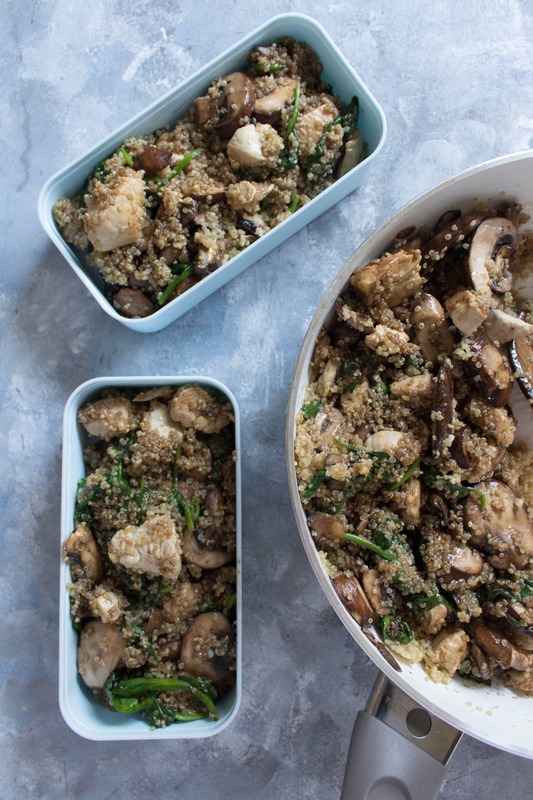 This one pot chicken and quinoa with balsamic dressing takes less than 40 minutes to make and it is easy as pie. Weeknights are usually a little insane because there are days that I work til 8:30PM and not home until almost 10PM. This means I have to start cooking before work or super late at night and usually at that point, I don’t feel like doing anything elaborate so this one pot chicken and quinoa with balsamic dressing makes life so easy. Protein? Check! Carbs? Double check! Veggies? Triple check! It’s a one pot wonder that takes less than 40 minutes to prep and cook. Plus, scoop some into your tupperware and boom meal prepped for the next few days (you know… when H doesn’t eat it all. That’s right, H had almost 1/4 of this for himself! H’s seal of approval). Don’t want to mince your garlic? Put your cloves into a food processor and pulse! If you want your chicken to be seasoned differently than the quinoa, season it as you wish but take it out of the pan (cooked) before adding the quinoa to the pan to cook. Change it up by adding different vegetables to this! Peas, corn, carrots, squash, you name it! Don’t like quinoa? Replace it with orzo! 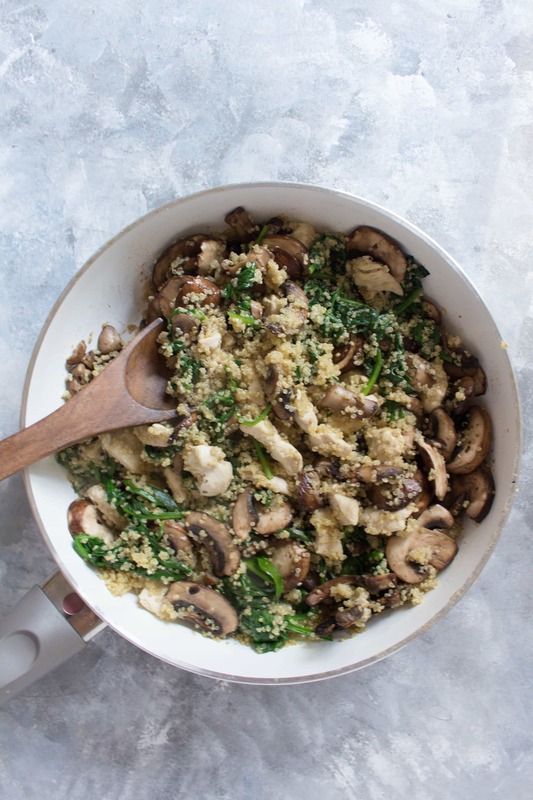 One pot chicken recipes can be overcooked easily so make sure you don’t fully cook your kitchen before you cook your quinoa. In a pan, melt half your butter and cook your mushrooms. After they've cooked through, place the mushrooms aside on a plate. Back in the pan, melt the other half of your butter and place your garlic in. After a minute and the garlic is fragrant, add in the cut chicken. Stirring occasionally, cook chicken until lightly browned. Pour in the quinoa and water into the pan, cover it, and bring it to a boil before turning down the heat to a simmer. The quinoa should take around 15-20 minutes to cook. 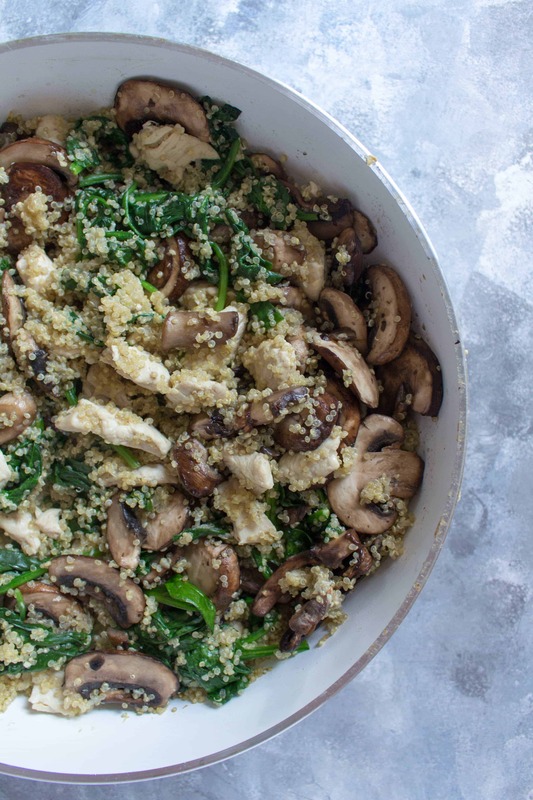 While the quinoa is cooking, in a bowl, mix together your olive oil and balsamic vinegar. 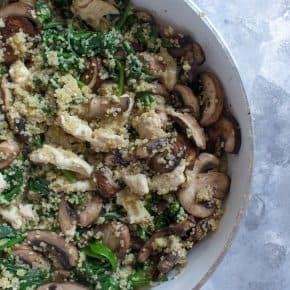 Once the quinoa is cooked, mixed your spinach in until it's a little wilted, and then add the mushrooms back into the pan. Stir everything together and it drizzle your balsamic dressing into the pan if you are serving immediately. Looking for more one pot or sheet recipes? 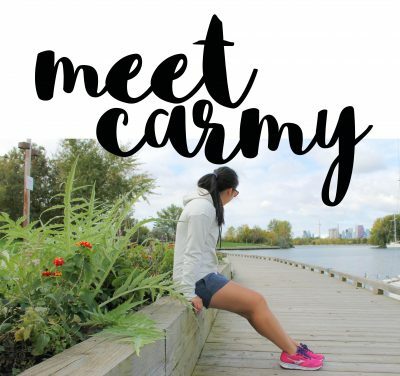 Previous Post: « Adventure Time: I’m Running Ragnar! Made it for dinner today and it was delicious!